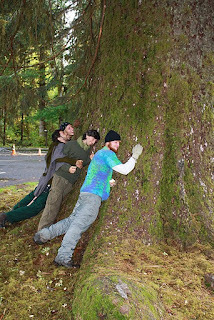 The Alderleaf Wilderness Certification Program crew spent an amazing 3 days on the Olympic Peninsula. The first day involved a visit to the Makah museum. Here students go to see first hand how the Makah used their skills to hunt, gather, build homes, maintain villages, and much more. The Makah have traditionally relied on the bounty of the Pacific coast to provide them with all of their needs. The Makah continue to live on the Olympic peninsula, and have a living culture and language. The following day, we hiked out to the Olympic coast to visit Cape Alava. There students got to experience some of that bounty from the ocean for themselves. 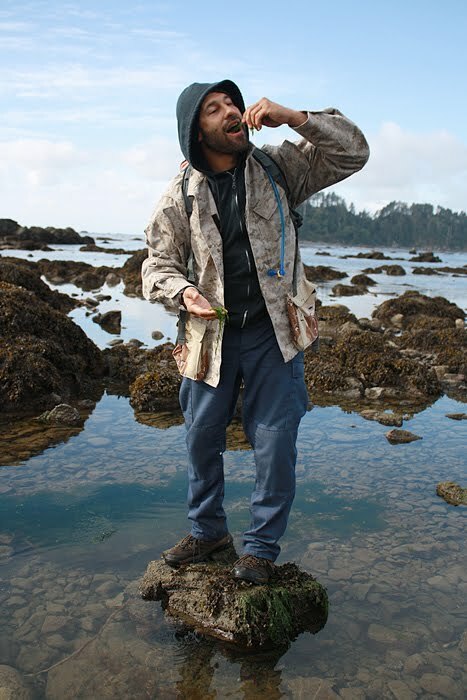 Here Alderleaf student Oscar Lugo Jr. samples some wild seaweeds. The coast has many species of edible seaweeds, as well as a rich variety of other sea life. Students got to see bald eagles, harbor seals, California and Steller's sea lions, sea otters and more. 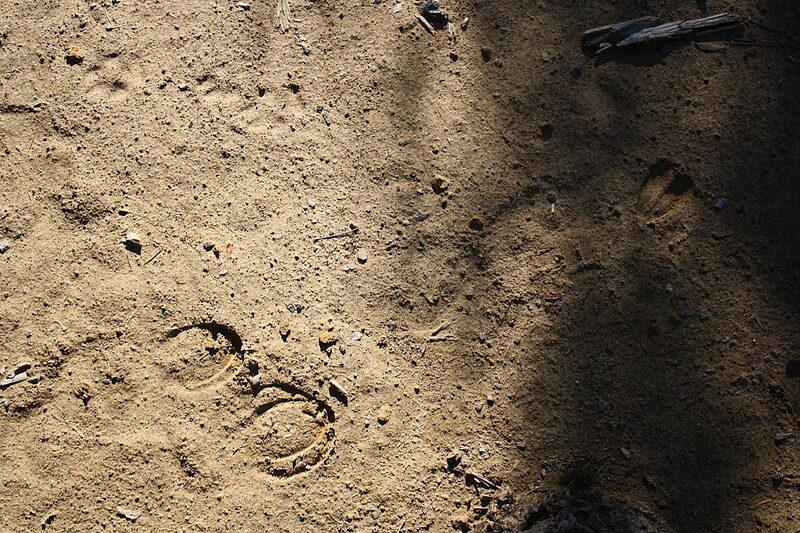 Even the tracks of a cougar and bear were spotted walking along the beach! The next day was spent getting acquainted with the old-growth forests of along the Hoh river, an area known as the Hoh Rainforest, within Olympic National Park. 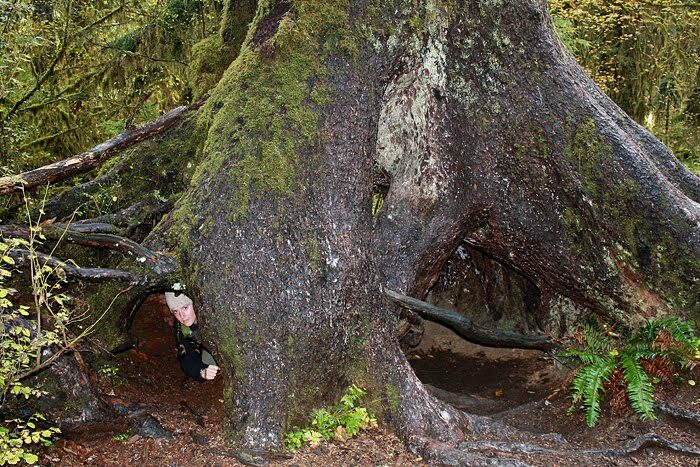 Many of the trees in this forest are grand, gnarly old giants like the Sitka spruce tree being embraced below. 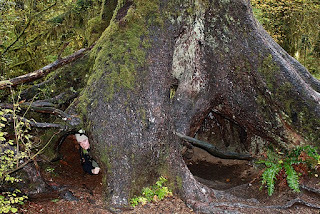 Here, Alderleaf student Amy explores the roots of the another massive spruce tree. This forest can make you feel small and help you really appreciate how big trees can get under the right conditions. The Olympic peninsula is always an amazing place to visit. We all headed home both satisfied and a bit regretful at having to leave such a magical place behind. The wildlife tracking apprenticeship headed out for a day of trailing in the pine forests of the eastern cascade mountains. As we wandered out into the beautiful fall landscape, we saw the tracks of a variety of animals including elk, mule deer and coyote. 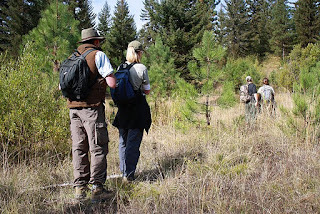 Our main goal was to pick up the fresh trail of an elk. After wandering through the crisp air and sunshine, we found the relatively fresh trails of not 1, but 6 elk wandering together. These we followed through challenging terrain and a variety of tracking substrates. We saw where they had bedded down together, where they grazed and browsed, and where a large bull started following this group of 6. In several spots we observed where he trashed some small shrubs and left some antler rubs. His fur was still stuck to the sap. We ended the day having learned more about elk, ourselves and about the skills of trailing. All of us are already looking forward to another visit to the eastern cascades.